Assassin's Creed: Origins Release Date Set for October 27 | Nerd Much? E3 is literally days away, and the leaks are coming in fast. The ship is sinking with a new image from NeoGAF for Ubisoft’s “back to the roots” title Assassin’s Creed: Origins. The image shows what is presumably the cover of the game, with a release date of October 27. 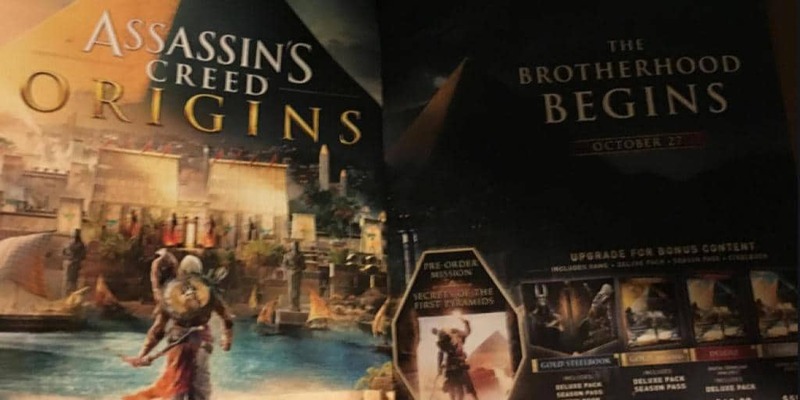 The rest of the Assassin’s Creed: Origins cover depicts our new protagonist walking towards a river, and across the river, there are the two towers belonging to the Temple of Luxor — though I could be entirely wrong. It nonetheless appears to be a bustling port city in the poster. On what is presumably the player character, is a hawk on the shoulder, a sweet looking labrys (a double-bitted ax), quiver of arrows, and a bow in one hand. The person looks to be quite dark skinned, but that might be either clothes or the quality of the picture. Otherwise, we have some hints as to what the special editions might include. Such as a pre-order DLC mission titled Secrets of the First Pyramids. This comes with a small picture of the aforementioned person holding up a torch, implying the DLC might involve a bit of searching in dark places. The Gold Steelbook edition includes the deluxe pack, season pass, and steelbook. This goes for $109.99. The Gold edition below that level also includes the deluxe pack and season pass but not the steelbook. This is priced at $99.99. The deluxe edition, though it’s a bit blurry so I might be wrong, includes digital game art, and the deluxe pack for $69.99. And what we can safely assume is the standard edition, going for $59.99.